Curious about the life and times of our spectacular admissions consultants? 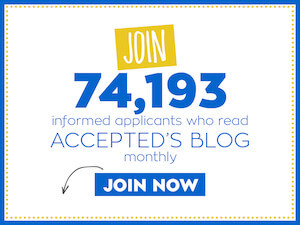 Please enjoy our newest blog series in which we interview the fabulous people who make up the Accepted.com staff. Next up is…Cindy Tokumitsu. Cindy: I studied at SUNY Buffalo, focusing on art history, criticism, and literature. These are all topics that involve the analysis of presentation, and the relationship between form and content – elements that prove consistently germane to my work with Accepted. Regardless of admissions trends and the evolution of the process as it becomes permeated by technology, these elements endure; they are at the heart of the process. Cindy: There are 3 main threads of prior experience that cohere into this ideal job. First, many, many years ago, I taught English in Japan. This experience taught me to understand each person’s learning style and learning needs, and to help non-native English speakers become more natural with the language, so they could express themselves. Second, I worked for a niche business publisher for six-plus years first as an acquisitions editor and then as editorial director. This experience familiarized me with business. It also taught me to understand a target audience and develop products that met their needs. Publishing is a collaborative effort ultimately, and it also made me a sensitive and astute collaborator, as I was the link between our authors and our marketing and finance teams (in some ways resembling my role at Accepted as link between the client/applicant and the adcom readers). Third, and not least, I worked for many years as an independent writer, editor, and project manager. I worked a lot on marketing, finance, and education materials. Among other things, it enhanced my ability to take raw content and out of it fashion an effective story, case, or presentation for a given audience. The breadth of content and diversity of people I have worked with is quite amazing, and this breadth helps me see each type of content and each person more clearly – more so than if I had been immersed in one specialization only – the relative perspective is valuable. Cindy: No surprise here – the endless learning, plus the amazing people I meet. People who not only impress me, but, often, move me with their life experiences, their tenacity, and their courage. Cindy: I work with applicants to all types of programs: MBA and other business/finance program, law, med, and other various grad programs. The bulk of the work in recent years is with MBA and EMBA applicants. 1. As you work on your application, keep laser focused on making it answer one core question: Why will the adcom admit you over other well qualified applicants from similar backgrounds? 2. You’ve probably heard it before, but my 15+ years of experience have shown it to be consistently true: To differentiate yourself, it’s not a matter of having the most dramatic story, the most unusual experience, the rarest demographic – it’s what you have to say about your experience, whatever it is. I’ve read outstanding, compelling, unforgettable (dare I say sometimes hilarious) essays written about something as seemingly mundane as playing weekend basketball with one’s buddies, and as plebian as growing up in a “typical” Omaha family – the applicants got into top-5 MBA and law programs. It’s a matter of the person, the individual, who’s doing the telling. Show your perspective, your character, your synthesis of experience. Have, and express, a point of view. 3. Clarify your motivations, whatever you’re discussing – whether describing your goals or actions you took. Your motivations are what make the admissions readers care about you and your candidacy. Learn more about Cindy and how she can help you get accepted!